Pele Mountain Resources has released an NI 43-101 resource estimate for its Eco Ridge uranium and rare earths project in Elliott Lake, Ontario. 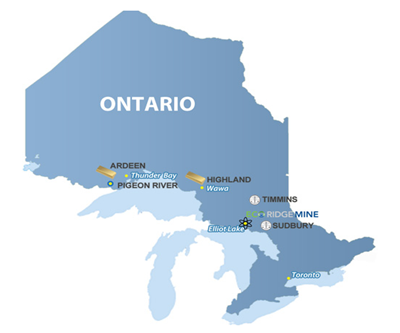 The resource includes 51.9 million pounds of indicated total rare earth oxides (TREOs) and 15.2 million pounds of indicated uranium oxide. In the inferred category, the report specifies 96.3 million pounds of TREOs and 31.4 million pounds of U3O8. “Our new REO resource is exciting because it provides a potentially significant source of by-product revenue at Eco Ridge and it places Pele on a short list of emerging North American rare earth developers." Shefsky said the next step is to complete an updated NI 43-101 preliminary assessment, which is expected in the second quarter of 2011. The PA will feature an economic model that combines the rare earth oxides and uranium oxide estimates, as well as mining, process and waste management designs achieved since Pele's initial scoping study in 2007. "We believe Eco Ridge contains an important future source of U3O8 and REO and we are determined to rapidly advance its development," said Shefsky. The project is 100%-owned by First Canadian Uranium, a subsidiary of Pele Mountain Resources.